Haq's Musings: London Mayor Sadiq Khan Hails Triumph of "Hope Over Fear; Unity Over Division"
London Mayor Sadiq Khan Hails Triumph of "Hope Over Fear; Unity Over Division"
Mayor Sadiq Khan was referring to the nasty and divisive Islamophobic campaign of his defeated Conservative rival Zac Goldsmith. Question: Is Donald Trump, the presumptive Republican nominee for US President in 2016, paying attention to what just happened in London? 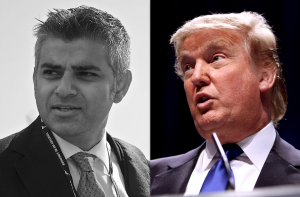 If elected, would Trump ban Sadiq Khan's entry into the United States? Prior to Sadiq Khan's historic win, several British Pakistanis have been elected and served as mayors of major British cities like Birmingham, Bradford and Manchester. 1. Khan has won more votes than any other politician in the entire electoral history of the United Kingdom. 2. Khan is the first elected Muslim mayor of a major European capital that served as the seat of the global British Empire for several centuries. The British Empire was once so large that the sun never set on it. 3. Khan, whose father was a London bus driver, is the first mayor of the British capital to emerge from the working class. 4. Khan comes from a family of two generations of immigrants: His grandparents migrated from what is now India to the newly created state of Pakistan in 1947 and his parents migrated from Karachi to London in 1969. Sadiq Khan was born in London in 1970. The Conservative party campaign of Zac Goldsmith resorted to the desperate tactics like the use of anti-Muslim bigotry to overcome Sadiq Khan's big lead. British Prime Minister David Cameron made the false allegation of Sadiq Khan's links to ISIS supporters. Cameron appealed to London's British Indians of Hindu faith in a letter highlighting the warm welcome he, Zac Goldsmith and the Conservative party government extended to Narendra Modi, the Hindu Nationalist prime minister known for the state-sponsored 2002 massacre of thousands of Muslims in Gujarat state. The election results show that these cynical actions of the Conservatives backfired. Goldsmith's Trump-like tactics of fear and division have backfired with a landslide win for Mayor Sadiq Khan in London. It's clearly a triumph of hope over fear, unity over division. Will Americans take their cue from Londoners to deal a historic defeat to Donald Trump on Tuesday, November 8, 2016? Let all Americans of good-will come together to make it happen. Will London Make History With Sadiq Khan? Do not underestimate the gullible nature of american electorate. This is the same electorate who elected George Bush Twice. First time they can be excused for it but second time they were well aware of his agenda. They elected him because of Fear. USA is not UK. I think the american Public has tilted conservative in nature over the past 30 years. The only thing they have progressive is Abortion and LGBT rights. Trump is the first Republican nominee who is liberal on these issues and poses a big danger to Democrats. He even talks about building infrastructure at home and that is democratic agenda. The republican Administration is opposing him because of that. I think He has a decent chance of becoming the next US President. It is time to buy property in Pakistan. The property values in Pakistan will sky rocket once Trump is president. You will see a lot of Pakistanis start looking at backup plans. Imran: " I think He has a decent chance of becoming the next US President"
It appears unlikely given his support base. Here's why: John McCain and Mitt Romney, the last two Republican candidates since 2008, won the majority of white votes but failed to win the general election. Each of them got 60% of the 70% white votes that add up to 42% of the overall electorate. In addition, each of them got only 6% of Black votes and about 26% of the Asian and Hispanic votes that prevented them from gaining the overall majority needed to win. Trump's campaign rhetoric has managed to anger all minority groups, particularly Mexicans and Muslims. He will get even fewer minority votes than McCain and Romney polled in the last two general elections. Finally the pilot came by, and approached the real culprit behind the delay: that darkly-complected foreign man. He was now escorted off the plane, too, and taken to meet some sort of agent, though he wasn’t entirely sure of the agent’s affiliation, he would later say. What do you know about your seatmate? The agent asked the foreign-sounding man. And then the big reveal: The woman wasn’t really sick at all! Instead this quick-thinking traveler had Seen Something, and so she had Said Something. Had the crew or security members perhaps quickly googled this good-natured, bespectacled passenger before waylaying everyone for several hours, they might have learned that he — Guido Menzio — is a young but decorated Ivy League economist. And that he’s best known for his relatively technical work on search theory, which helped earn him a tenured associate professorship at the University of Pennsylvania as well as stints at Princeton and Stanford’s Hoover Institution. Singh: "Sadiq khan got 44% and Goldsmith got 35% votes .............. I do not think its a landslide victory"
57% for Khan vs 43% for Goldsmith is a landslide. Khan picked up 44 percent of first preference votes to Goldsmith's 35 percent. The Labour candidate then picked up enough second preference votes to cross the 50 percent threshold, with 57 percent to Goldsmith's 43 overall. Being a proud Pakistani and living in the great city of London for many many years I'm delighted at the number of Pakistani origin politicians who have been chosen to represent their communities at Westminster and I'm sure they will do a tremendous amount of work for all their constituents and will also be a bridge between our two countries. I am also hugely proud and delighted to have Sadiq Khan as my Mayer in London, during the election campaign he was pitted against a right wing conservative candidate named Goldsmith, a brother to our Jamaima Khan, who conducted a very racist campaign against him, accusing him of sharing ideology with known terrorists but the great people of London saw right through his lies and voted for Sadiq in huge numbers. Our community has come along a long way from my fathers generation who came here to do the jobs the British did not want to do themselves, our young men and women here now are highly motivated, educated, gifted and hardworking and I forecast a very very bright future for our Pak/Brit community.